Considerations when buying Tin Lined Cookware. 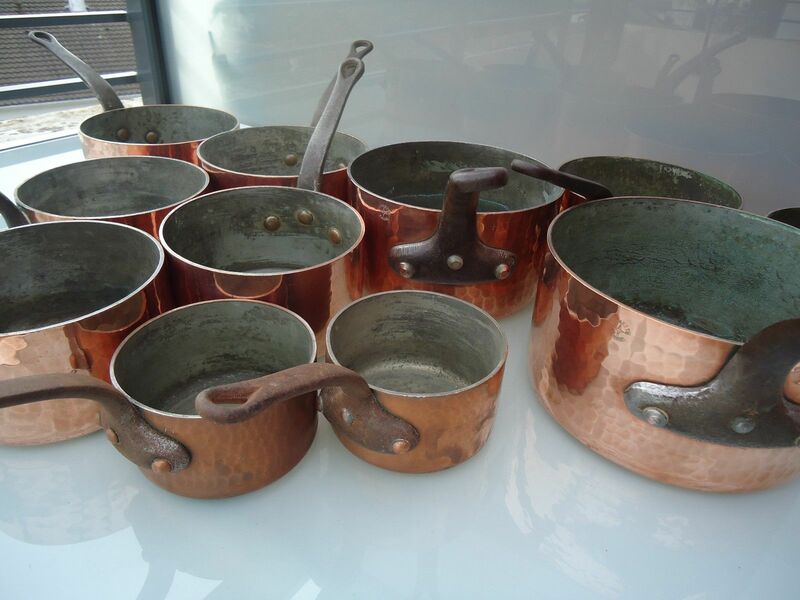 Much can be found about the different grades of copper cookware. Regarding standard sets of saucepans or part thereof, Saute pans or splay sided Windsor pattern, there are recognized grades to be made aware of. 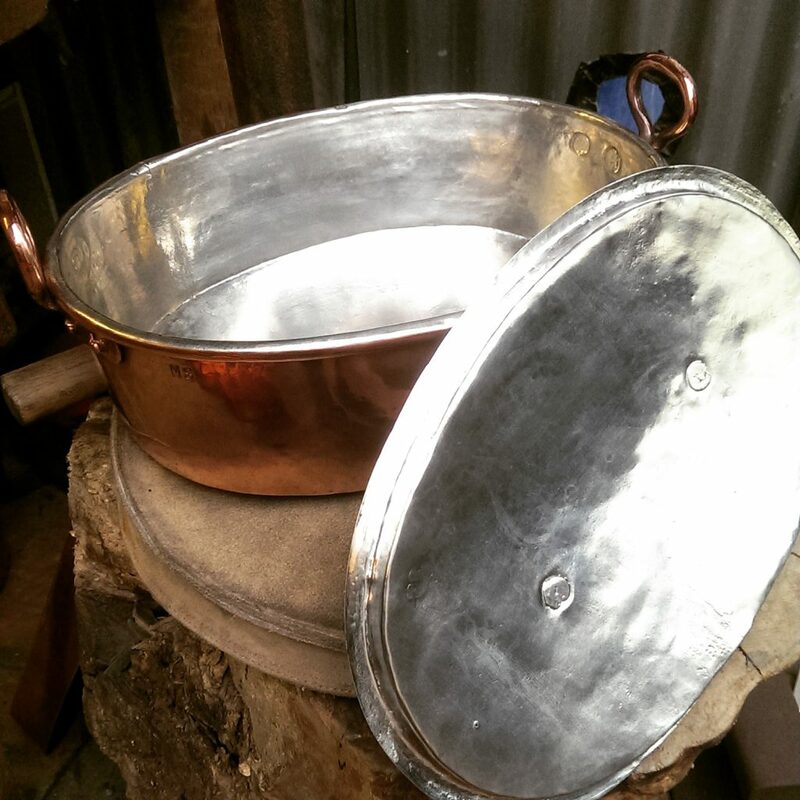 This is much the same for all copper cookware with exceptions of specialist wares. Generally speaking, the thicker the copper, the better the pan!!! 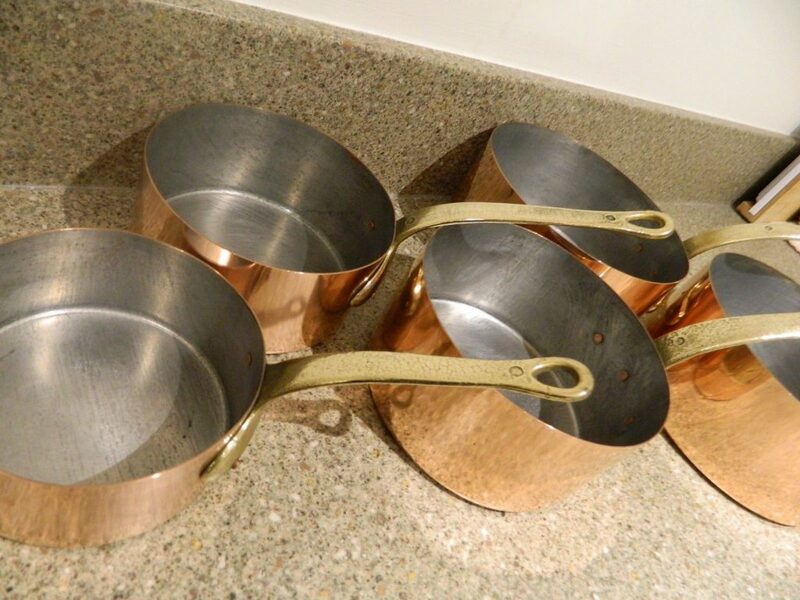 Pots and pans are formed from copper sheets of various thicknesses, with those in excess of 2.5 mm considered commercial (or Extra-Fort) grade (THE BEST). Average weight for a set of 5 standard saucepans ranging from 12-20 cm’s would be around 9-10 kg. 3 mm+ The zenith of copper cookware. Between 1.5 mm and 2.5 mm wall thickness is considered utility (Fort) grade (Good). Average weight for a set of 5 standard saucepans ranging from 12-20 cm’s would be around 6-7 kg. Please do not waste your time or money with anything thinner than 1.5 mm, really 1.8 mm would be minimum in my opinion. If a set of 5 standard saucepans ranging from 12-20 cm’s is below the 5 kg mark I would seriously reconsider & look for something heavier. Having said this many old English pans Circa 18th-19th Century are often around the 1.5mm mark. If the handles are not seriously corroded they are certainly worth reconditioning for further generations of use! Avoid anything as below or the like with a rolled rim. Thicknesses below 1.5 mm often require tube beading or edge rolling to reinforce structural rigidity. Exceptions are made for hammered, work hardened items such as those made by “Ruffoni”. Although 1 mm or thinner these work hardened pans express some of the characteristics of much thicker cookware. Please be aware that due to the thin metal these pans will be seriously responsive to heat! Other exceptions are made for larger antique items that command the extra rigidity a rolled rim provides. Many such items were produced during the Georgian era. Cauldrons & turbotieres are two such examples. If the rivet heads showing on the interior of the pan are not previously tinned take this as a glaring indicator of a poor pan!!! In many cases such pans as these will be “Tinned” with metals unfit for food use. Rivets will be fitted prior to the tinning on any pan that is intended for culinary use. Even if most of the tin is worn away from the head, as is often the the case, there will remain traces. 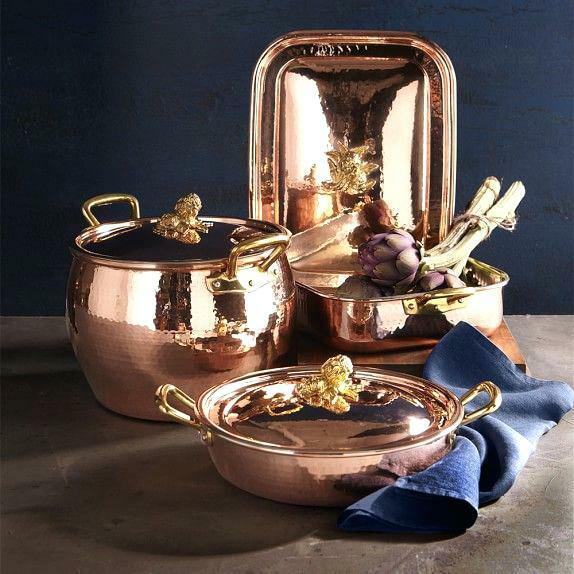 Although thinner copper can be tinned, due to the nature of copper & tin at high temperatures, which is almost impossible to get even & controlled on a thinner piece, the finish although perfectly usable may result in a matt finish & not be as glossy as on a thicker pan. With use the matt finish will buff up from the use of wooden spoons etc. No Vernier caliper!!! How thick are these pans??? 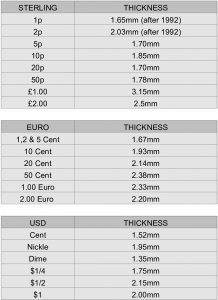 Here are the thicknesses of Sterling, Euro & USD that may be of invaluable use. This should give you a good idea & possibly something to consider asking if making a distance purchase!? Clearly any other currency will have a coin specification that can simply be found by searching the web. A rolled edge / iron ring on the upper rim of the cookware indicates thinner copper! Why it matters? The thickness of the copper is important because of 3 reasons. Thicker copper (starting at 1.5mm) provides more structure and durability without the need to add additional support with a rolled edge and iron ring. The base of thicker copper cookware (starting at 2mm) will not warp and is therefore better suitable for electric or glass/ceramic stoves. The thicker the copper the higher the value of your cookware. 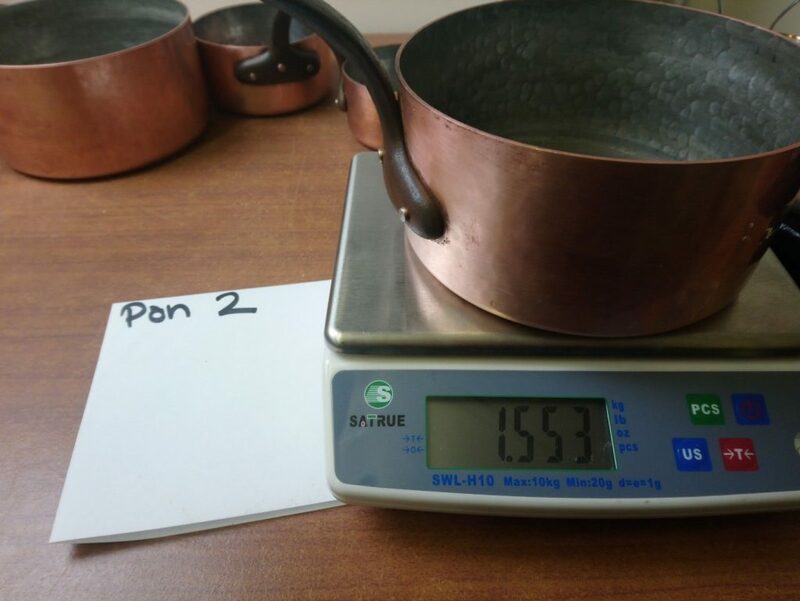 If the copper cookware has a rolled edge on the rim, it has a maximum thickness of 1.5 mm or less! Thinner copper products (up to 1.5 mm) require a rolled edge and iron ring to ensure rigidness and prevent deformation. Thinner copper is absolutely fine when you mainly use your cookware on a gas stove for boiling. It will provide you with the same advantages as thicker copper cookware in regards to thermal heat conductivity and cooking in general. 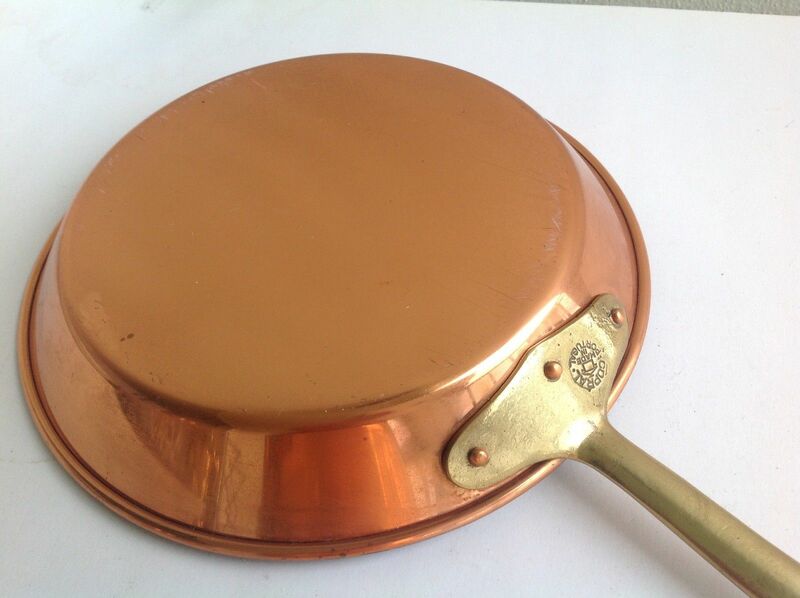 The fact is, thinner copper is less expensive in the production process and will also easier deform (warping of the base) which could be a problem if you are using your copper cookware on a flat surface such as an electric or glass/ceramic stove. Thinner copper does not have the sturdiness and structure needed and has to be supported by implementing an iron ring around the rim and rolling the top edge around it. Nor is this thinner copper good for controlling the temperature accurately & evenly as ingredients are added. The heat is simply sucked from the pan resulting in more of a steaming process rather than a browning/sauteing process! You will not find a rolled edge with 1.6mm or thicker copper cookware. Beware, there are some pans incredibly thin that do not include a rolled rim in their construction! These are deemed decorative! If you are making a conscious decision as a consumer to purchase thinner copper (up to 1.5mm) because you are using this particular pot only on a gas stove where a deformation of the base is not as noticeable, that is absolutely fine. Unfortunately some retailers or manufacturers might leave the thickness of their copper unknown to you and simply refer to the rolled edge as a “pouring-rim”. That is not what it is. It is simply a great indication that the cookware you are looking at is max. 1.5mm thick! At any of Newlyn Tinning’s stores you will only ever find a rolled rim on larger stockpots, cauldrons, turbotieres & the like. Never on saucepans or Saute’s! 100% pure copper without any other materials mixed in! Why it matters? Copper is far superior to all other materials used for cooking and that is what you are paying for so you want to make sure that you are not getting anything less then 100% pure copper. You should be ok seeking out vintage & antique as undoubtedly they will be pure copper if previously tin lined. Every pan supplied by myself is guaranteed to be pure, 100%, Copper. Rivets are made from copper! Why it matters? Rivets made of steel are usually used by mass-market manufacturers since they are cheaper and therefore preferred by those manufacturers. Look at the rivets that secure the handles or lid of the copper cookware. If they look like steel (no copper color) chances are that they are made from steel and not copper. Some modern brands use stainless rivets. This too is ok but not to be mistaken for poor quality aluminium rivets! Pure tin used and definitely no substitute such as tin-paste or lesser quality of tin! Why it matters? Traditionally used since well before the Bronze Age (the copper age! 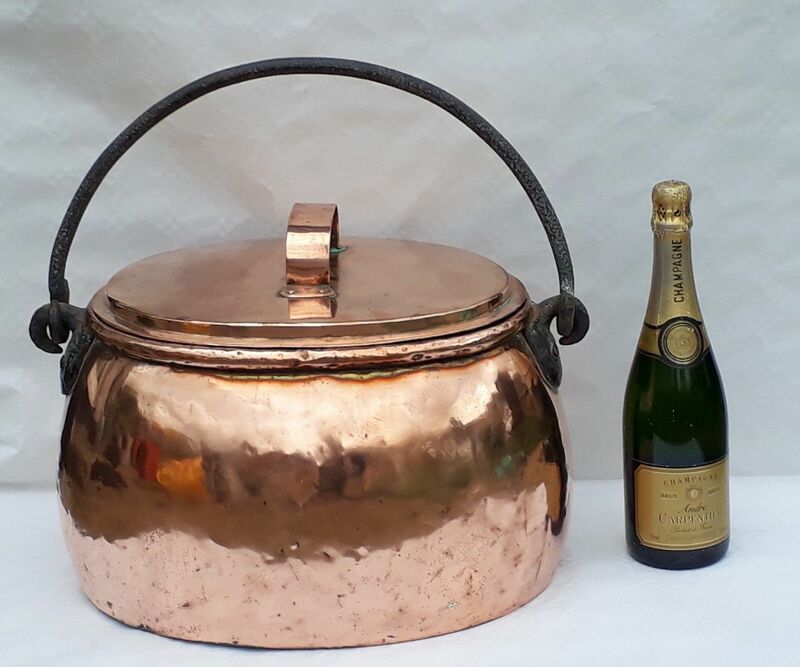 ), tin is a great lining for all copper cookware especially when preparing food with higher alkaline or acid levels (wine, tomatoes, vinegar, etc). It creates a protective barrier between your food and the copper and also has great non-stick capabilities! Whether a copper product is lined with only 100% pure tin or has some impurity from other materials is impossible to see and one has to believe whatever is written or being told. Any pans sent to Newlyn Tinning for re-tinning will be stripped of all old lining & re-tinned with 100% pure Tin (Sn) so is not an issue or anything of concern. Unfortunately most of the tin used today has a purity of 99.9% or less and might contain other elements. Others might say that 99.9% or less is almost 100% but we think that “almost pure” is not pure and use only 100% pure tin for all of our tin lined copper products & re-tinning service. No unfinished rim that shows copper! Why it matters? For copper pots with a thickness of min. 1.5mm, the rim is not rolled and rather flat. Look at the top of the flat rim and see whether it is tinned on top of the narrow rim as the inside of the pot is. 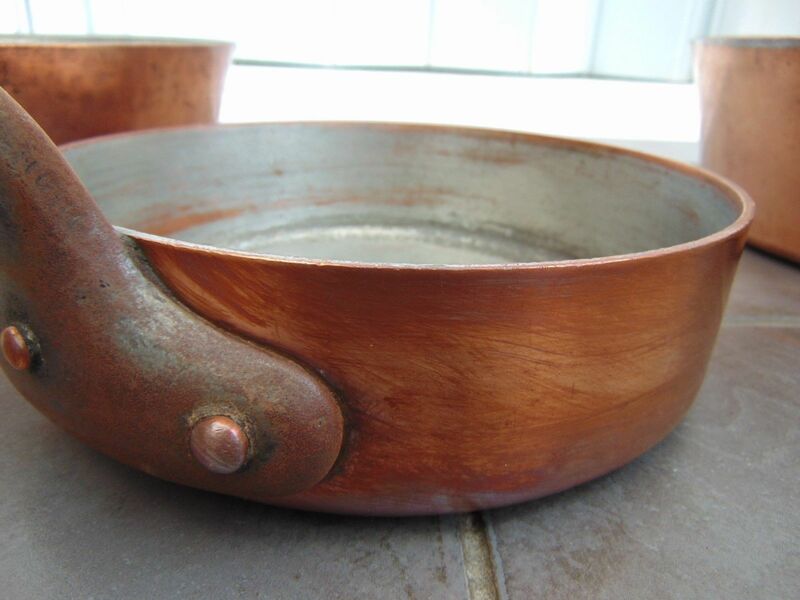 Do not be discouraged from buying an antique or used pan if the rim is not tinned. Many “Tinners” simply lack the skill or care & attention to detail to have previously accomplished this & it will be resolved once re-tinned here. All copper rivets are tin plated. Why it matters? This way it is ensured that the tin lining covers the entire inside of the cookware without any gaps. This is easy to spot. If a different material such as steel or iron is used for rivets, they usually have a slightly different color than the tin on the inside. Some pans will have Stainless rivets and this is also acceptable & used by some top makers in modern times. As always, everything supplied by Newlyn Tinning’s Shop will be the finest available. Intended for hotel & restaurant use or the home cook that want the best!